But these seeming problems when deploying as a coalition has not stopped the Imperium. Instead, they have been practicing a form of expeditionary hybrid warfare against the north. It has some fascinating implications for both the game and the geopolitics of New Eden. So, the first thing here is to explore the context of the Imperium’s expeditions in the north. As we know, they were ejected from it in WWB. Since rebuilding in Delve, they have steadily nosed northwards. Three standout events have occurred during this trek back ‘home’. First, there was the August 2017 Hakonen deployment. Displaying excellent tradecraft, much of the Imperium moved to the system of Hakonen in Lonetrek. Unfortunately, though the move-op was well conducted, the rest of the campaign was not. The subcapital performance was adequate, but without sufficient reserves of supercapitals and capitals, any serious threat was squashed. They returned home a month later, with little to show for the campaign. The lesson that much of New Eden took from this was that the Imperium were incapable krabs. Military analysts pointed to the impracticality of conducting a campaign under an enemy supercap umbrella. But the Imperium, it seems, did not take this point of view. Instead, they drew lessons on how to work under an enemy supercap force. 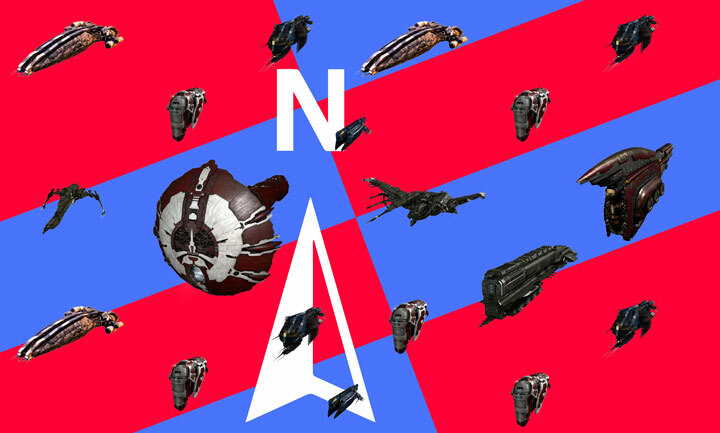 The Imperium’s Special Interest Groups (called SIGs), which we will get to in a moment, started operating against the north in October. However, this effort picked up the pace with the Imperium conquest of Fountain in November. This was the second significant event. It was substantial because owning Fountain provided a safe logistical passage from Delve to the borders of the north. Thirdly, there is the battle of 9-4. 9-4 seemed to be an effort to test the waters, as it were. It does not look like the Imperium intended to conquer the north. From the very first, it was billed as ‘keepstar purge mode’ (to quote The Mittani). Instead, it was likely an attempt to raise morale and see what kind of ‘apex force’ the north could muster. And it showed them that purely conventional operations were not viable. Partly because of near server breakdown when large forces clash. So, this sets the milieu of Imperium operations in the north. The conquest of Fountain gave them a secure launch-pad for operations. The Hakonen campaign gave valuable experience in fighting beneath a supercapital umbrella. 9-4 showed that a purely conventional approach would not work. Before we embark further into the analysis, it’s important to highlight – who is doing the fighting here? On the northern side, we have the Guardians of The Galaxy (GoTG) coalition, consisting of around 1800 actively PVPing players (according to ZKillboard) with total numbers of ~13,000. GOTG has a substantial capital and subcapital force. The Imperium, meanwhile, has deployed two of their SIGs to the north. These are Black Ops, who specialize in stealthy operations; and the Reavers, who are a long-term guerrilla force. These are occasionally reinforced by Welp Squad, who fly cheap ships with intent to die nobly. Their exact numbers are not publicly available, but this writer would estimate their deployed force at perhaps 500 pilots. What is the Imperium strategy? 9-4RP2 showed that the Imperium cannot straight-forwardly win a conventional battle. The lessons of a hundred calls for ‘wolfpacks’ throughout EVE Online history show that purely irregular warfare, while very damaging, is not lasting. What the Imperium needed was a way to unify conventional and unconventional action into one whole. They found their answer by, consciously or unconsciously, adopting a strategy of hybrid warfare. Hybrid warfare is defined the Russian Ministry of Defence as, “the integrated utilization of military force and forces and resources of a non-military character”. This is a fair bit of anodyne legalese. However, an examination of the 2014-2015 Donbas campaign reveals it in action. And there, it was far from anodyne. In Donbas, an eastern area of Ukraine, the Russian military employed a triad of forces. They used irregular troops and partisans to put pressure on the government. At need, they deployed conventional surgical force to dismantle efforts against partisans. And this was all aided by a strong media campaign against Ukraine. While the situation is obviously different, we can see some similarities between this and between Imperium action in the north. Black Ops provides experienced harassers, which by killing krabs puts pressure on GOTG leadership. Where possible, conventional forces – dreadnoughts and large subcapital fleets – surgically contest GOTG responses. The recent Titan losses are one notable example. And, naturally, /r/Eve has been filled with propaganda designed to delegitimize Sort Dragon without denigrating GOTG line members. The intent is not to conquer the north. That would require a commitment of resources far in excess of current levels. Further, the Imperium is unlikely to move their population from Delve. And without that, a conquered north could not be held. Instead, their goal seems to be two-fold. Firstly, they want to generate good content for line members. Living in Delve means that satisfying PVP content can be hard to find. Expeditionary warfare gives members a chance to stretch their legs and have good fights. Secondly, and perhaps more importantly, they want to see if they can destabilize the north. Without Pandemic Horde in the area, GOTG is a crucial element of the northern alliance. Eroding the morale of line members and keeping leadership focused on home defense reduces the threat to the Imperium. The combat is still very much ongoing. Despite some heavy titan losses in a tightly contested fight in ROIR-Y on the part of GOTG and an overhyped alliance staging change, they have not won. The Imperium is likely to keep up this pressure and, until a response is devised, keep doing well. It is definitely possible, however, that other groups around the game will take note. Nothing the Imperium is doing is impossible, or even particularly difficult, for other groups to replicate. Therefore, we may see more hybrid warfare in the future. Great power wars may be fading away, but this method of combat may only grow. And that might be a rather good thing. What are some really excellent poetry blogs or web sites to post journal access? Hi to all, it’s truly a good for me to visit this web page, it includes priceless Information. bvSHfU You made some decent points there. I looked on the web to find out more about the issue and found most individuals will go along with your views on this web site. It’s amazing for me to have a web site, which is useful for my knowledge.